Autumn with you today to share this layered spring card featuring our lovely new Tandem Bike die. I wanted to use a particular Authentique paper collection and layer up all of my favorite patterns, so I used my Nesting Stitched Circles and Squares to form layers, popping each layer up further with foam tape. I seamed two squares together since I don't have the Rectangle set yet. The larger circle covers the seam. I double embossed the Tandem Bike in copper to achieve an enameled look. I added a touch of Dried Marigold Distress Ink watercolor to the center of the petals on two die cut Cherry Blossom Branches. I layered a Prima flower and crinkle bow over the cuts. The sentiment was stamped with $1 alphas and attached to the Cherry Blossoms with my Tiny Attacher. I hope you are inspired by this card! Thanks for your visit. 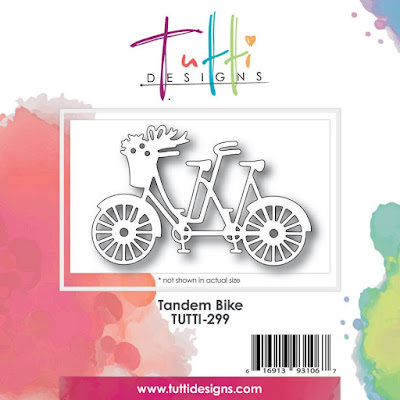 Purchase your Tandem Bike die HERE today! OMG this is just beautiful Autumn! I love all the layers and your design is just perfect for this die! Fabulous inspiration ... thanks! Beautiful design and love those colors and your lovely layers! Now I have another die I MUST have!